Abstract. Changes to climate–carbon cycle feedbacks may significantly affect the Earth system's response to greenhouse gas emissions. These feedbacks are usually analysed from numerical output of complex and arguably opaque Earth system models. Here, we construct a stylised global climate–carbon cycle model, test its output against comprehensive Earth system models, and investigate the strengths of its climate–carbon cycle feedbacks analytically. The analytical expressions we obtain aid understanding of carbon cycle feedbacks and the operation of the carbon cycle. 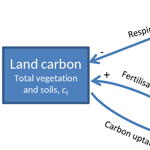 Specific results include that different feedback formalisms measure fundamentally the same climate–carbon cycle processes; temperature dependence of the solubility pump, biological pump, and CO2 solubility all contribute approximately equally to the ocean climate–carbon feedback; and concentration–carbon feedbacks may be more sensitive to future climate change than climate–carbon feedbacks. Simple models such as that developed here also provide workbenches for simple but mechanistically based explorations of Earth system processes, such as interactions and feedbacks between the planetary boundaries, that are currently too uncertain to be included in comprehensive Earth system models. How to cite: Lade, S. J., Donges, J. F., Fetzer, I., Anderies, J. M., Beer, C., Cornell, S. E., Gasser, T., Norberg, J., Richardson, K., Rockström, J., and Steffen, W.: Analytically tractable climate–carbon cycle feedbacks under 21st century anthropogenic forcing, Earth Syst. Dynam., 9, 507-523, https://doi.org/10.5194/esd-9-507-2018, 2018.